September draws to a close and I'm reminded what a beloved month it is in Florida. Not only are there intermittent changes in the weather bringing ever-so-slight hints of relief from summer's endless heat and humidity. It is when the culmination of all the sweat-equity invested during spring and summer is fully realized and appreciated. 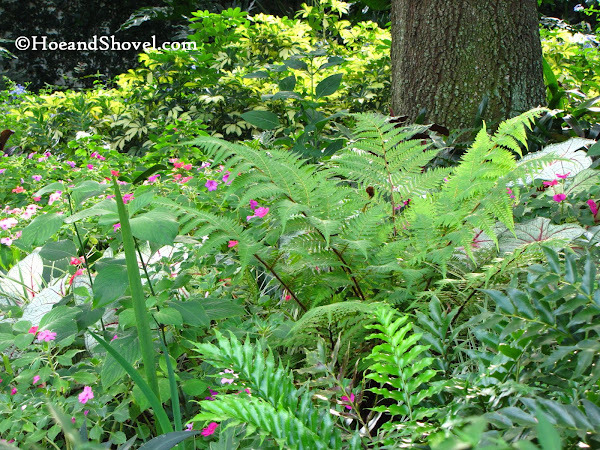 As I am out and about, refreshing the planting beds with new mulch and adding coleus and other cuttings here and there rooted from existing plants, it is the overall scenery of September that stands out to me. Autumn nights are growing longer or is it autumn days are growing shorter! Whichever way we say it we know that soon growth will gradually begin to slow-down. [I never really think it completely stops here as long as our sun is shining brightly.] But our winters have proven me wrong the last two years. That's another much-bemoaned subject I'll not pain dear readers with today. Working on increasing the presence of a middle-story, this spring, there were several young trees added (this one in the foreground a Rhaphiolepis indica Indian Hawthorn tree). Each addition will eventually fill-in the visual space between the low-lying under story at ground level and the very tall upper story of the mature oak tree canopy. In this area, the perimeter of the circle garden, the design thought was not only middle-story filler but the desire for a frost-proof, winter-blooming specimen tree. Eventually the Indian Hawthorn will serve the purpose of filtering some of the sun's rays on the most intense summer afternoons. As this gardener is learning and practicing more and more Right-Plant, Right Place principles I find seasonal transitions easier to accept and even admire. Needless to say, as the years go by, we are becoming better prepared for each season. If you are curious it is easy enough to take a look at the infant stages of the circle garden when it first began this past February by following this link. Viewing it from every angle now is a simple reminder that good design plans are the way to begin any new project. Yes, lots of diligent effort but so well-worth the rewards. 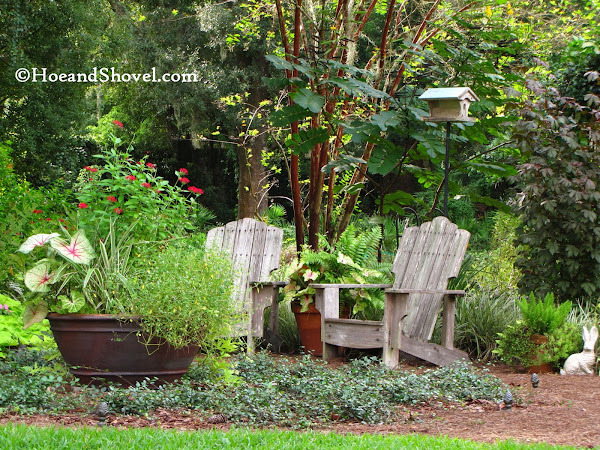 In the course of finishing this project it was decided to move existing well-worn chairs from the back patio into the circle garden pathway for a relaxing venue. There are two more chairs along the tropical pathway just a little further around the path for a shadier sitting spot. The adirondacks are perfect for a cup of morning coffee or late evening meditation. 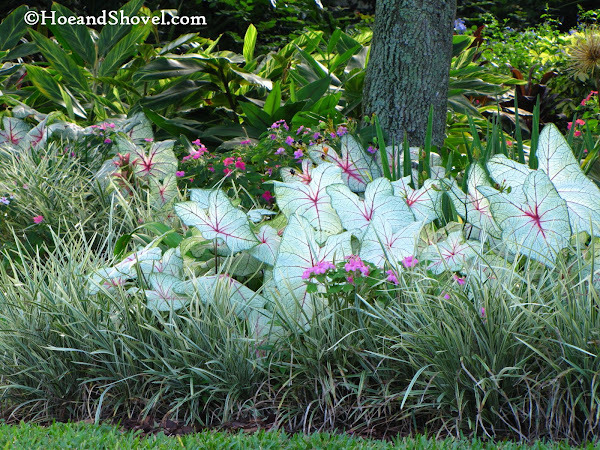 Careful timing of succession-planting caladium bulbs later in summer than is recommended makes for lasting foliage into these months of autumn. Our ground temperatures stay warm well into November which supports keeping the colorful leaves peeking out among the borders. The much-prized Australian Tree Fern never fully recovered from winter. *sigh* A new one, planted as a replacement, is tucked a little further under the tree canopy for better protection. Hopefully this isn't pushing right-plant, right-place philosophy. 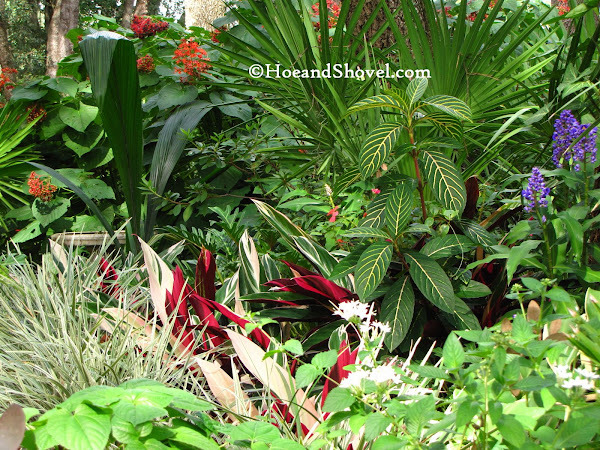 When all is said and done it is a risk I'm willing to take for the beautiful specimen it becomes in the shady garden. The curving pathway under the oak tree canopy draws me to wander down it and be thankful for every nook and cranny in this garden space. Energies expended to create this playground for imaginations at their purist always puts a smile on my face. Treasures innumerable are discovered by my favorite four year old while exploring every possible corner of the garden. Spiders and their webs are of particular interest at 4. He's been learning since he could toddle it is better to let them live for their good qualities than to be afraid of them. 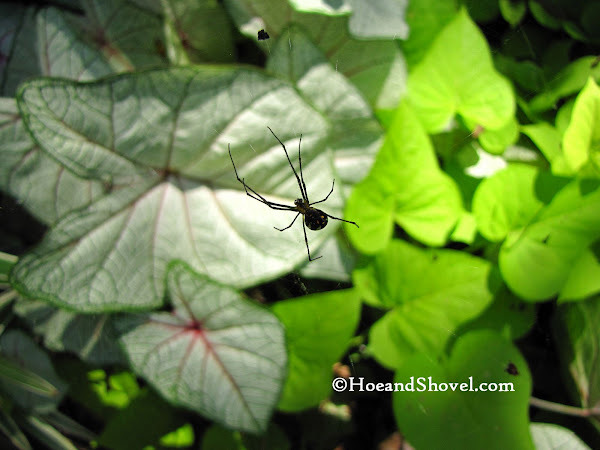 Some days we purposely have a spider hunt. Counting how many we can find and observing differences in body-size, coloring, shelter, and webbing. Oh, these facts are invaluable and make for endless conversation. 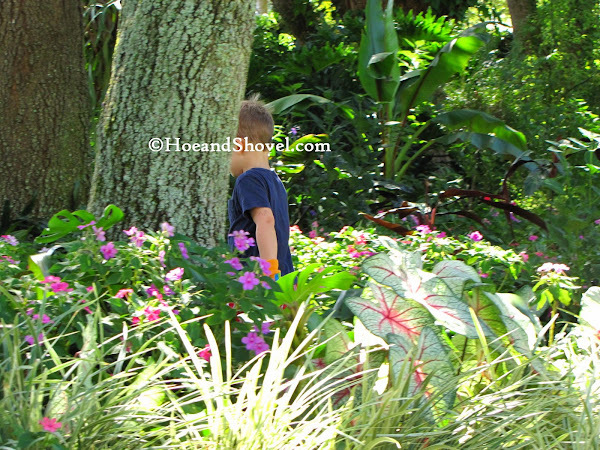 Seeing the garden through his eyes makes every venture into the garden extraordinary. I'm certain, as adults, it would do us a great deal of good to see our world with the sheer wonder and majesty of a child. 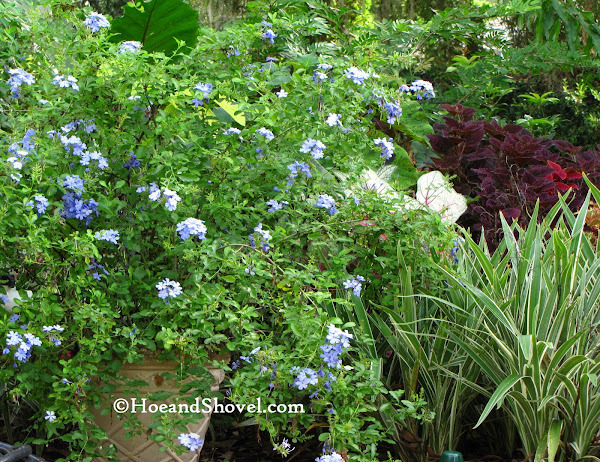 I am loving the blue blooms of plumbago in a container. Placed in the northside berm to help camouflage the pipes sticking out of the ground from the well-pump. As in every garden all is not perfect or complete in this garden. But isn't it rewarding to take a look around and be thankful for the small details as well as the results we envisioned months ago! 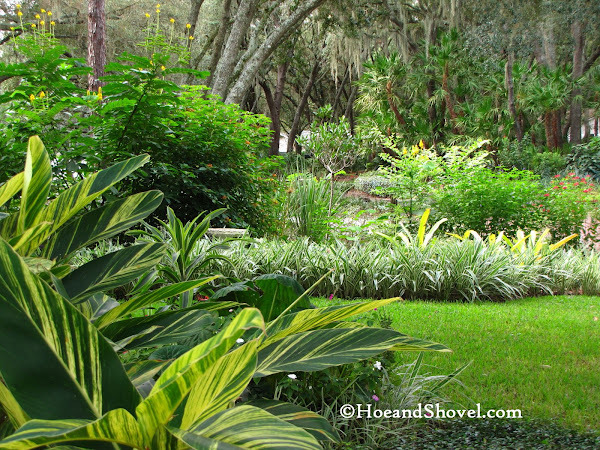 Excitement is on the horizon for when cooler weather visits and more projects can be accomplished. Happy autumn and gardening to you! Thanks for hanging through this long post! It is always fun to look at the garden through a 4yr old's eyes. They are not only innocent but keen observers of everything on their level. I think it is amazing how they can find the hidden to we who are taller. I can see how your garden is such a joy. It is a tropical paradise. What a nice read this morning. I am looking forward to fall gardening myself, it's been a long painful summer. Oh Meems, It is always a treat seeing your lovely gardens. I'm looking forward to working in mine more, now that the weather is changing. You have so much beauty going on around you, colors, textures, heights. 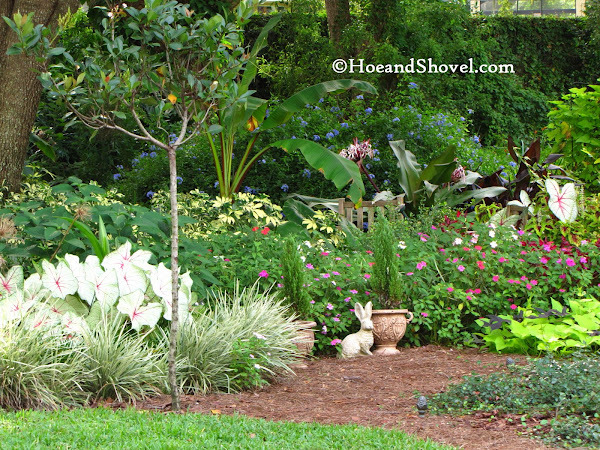 I have much to do in my gardens, thanks for the inspiration and eye candy. Yes-I can feel autumn in the air,but I am definitely going to miss the long days of summer.There will be less time to work in the garden in the evening.A trade-off for cooler weather,I guess. Hi Meems...You are so right about seeing the garden through the eyes of a child. I remember when my daughter was a toddler, she commented on the birds singing and I realized that I didn't even hear them until she mentioned them. That was eye-opening to me...obviously one I haven't forgotten. I do look forward to October. I checked back on my first post for October last year and we had a very nice cool front move through the first weekend in Oct...I think it was in the 50's. That sounds refreshing...unless it means that we'll have a repeat of last winter. If that's the case, I'll wait a little longer for a cool front. 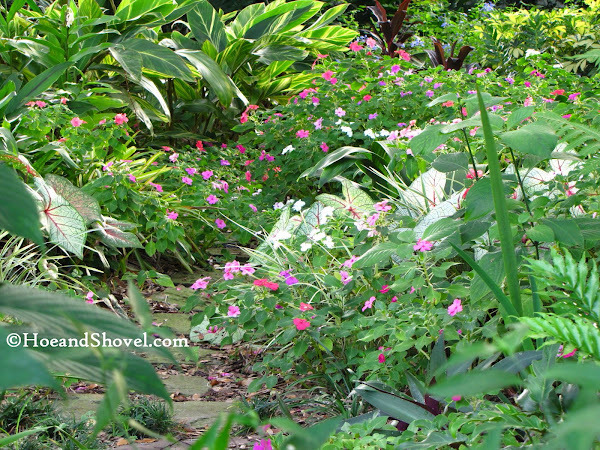 Enjoyed visiting your gardens in late September. We are so ready for autumn's mellowness. It means more dirt time for me! Yippppeeee! 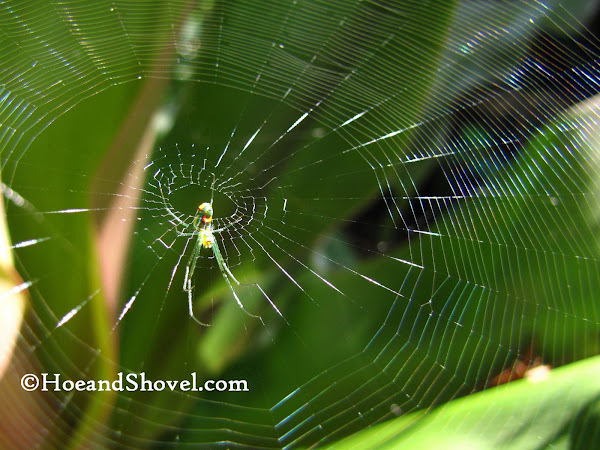 Love the spider webs-great homeschooling subject! 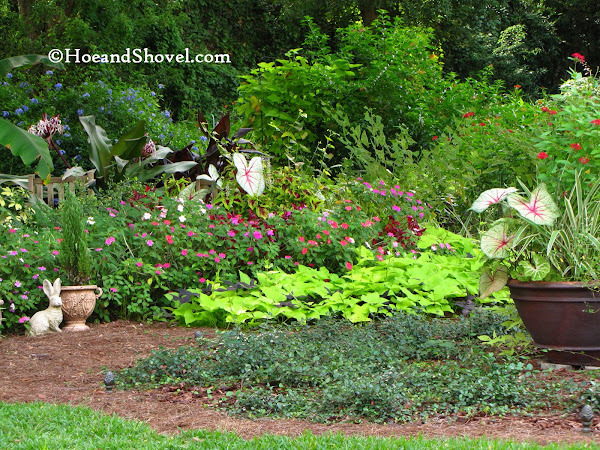 There is no perfect in our world, but your garden comes about as close as we get! Meems, every time I look at photos of your garden I see things I want to incorporate, and then feel sad because I do not have the room! I love how you have combined textures and colours, heights and light and shade. Just perfect! Awww, I miss the days when my little ones would spend hours exploring the garden. Perhaps some day I'll be a grandmother as well. Your vistas are beautiful, and I think those paths would be so tempted to wander down. 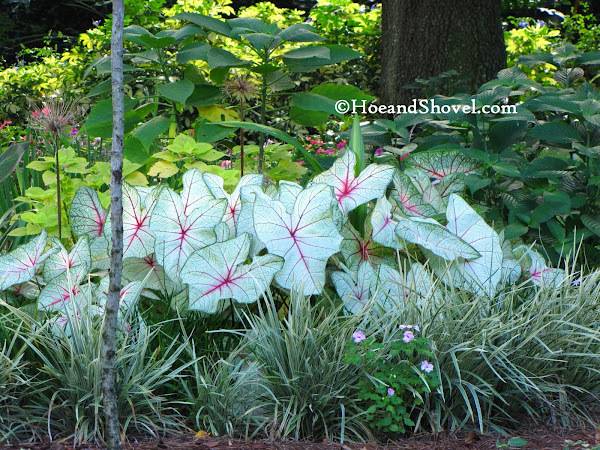 Do you buy new caladium bulbs every year, or do you lift and store them, then plant them at intervals? I've always just let nature do its thing, as I tend toward the lazy side. But as I see your caladiums still shining tall and proud, I do get a bit envious. Oh, the purity and willingness to learn... he is a sponge. It has indeed been a long summer. Yours has been very different. I hope autumn is better for you. There is always lots to do in a garden. Learning to just enjoy it without the pressure of the to-do's is always a challenge. Yes, love those evening hours after dinner in summertime. I do not prefer the shorter daylight ~~ guess we can't have everything. It is so revealing how we forget to notice when a little one hears every tiny sound. It is easy to teach them which birds make which sounds at this age ~~ their listening is SO keen. No 50's this Oct 1 but at least 60's... FINALLY. YAY! ... and less sweating. Gross, I know. But it is always something to look forward to. hmmm... didn't I see some patches of grass left in your yard? Thank you. The pathways are increasing around here as I take out more lawn. I'm sure someday you will be a grandma... but you probably want to wait until you get that last teenager raised so you can fully embrace the joys of being one. Yes, I buy more bulbs each year and I never lift the old ones out. I leave the old ones to do their natural thing. After they all come back (or not) I add new ones in late June/July to extend the growing time. I'm always happy in Sept/Oct when many (not all) are still looking crisp. Hello and welcome. I can surely do some rambling when it comes to garden talk. Thank you for sticking with me. I'm glad you enjoyed your visit... do come back as often as you like. Happy Autumn to you too! I do love the coolness of the weather we get. Less sweat in my eyes makes the gardening much more fun. Taking this photo tour was so enjoyable. Every view is so lush I feel I can actually see the plants growing. Not that I'm choosing favorites, but the view of the blue ginger with the palmetto and pagoda is just perfect. Meems, what do you know about Variegated Flax Lily...shade or sun. I am getting mixed reviews about the correct placement of it. I picked some up today and the tag read no direct sun at all. The internet says different things. I know it is a Florida Friendly plant. Thank you mam. I'm a big fan of the palmettos. They are often overlooked as they are so standard. But they play such a vital role as stalwart companions to just about everything in (almost)every understory. When the big drake elm was removed the glaring issue (other than the sun light :-) was the emptiness in the middle story space. It will take a while but it's now feeling much cozier. Thanks... and thanks for stopping by. Beautiful design. I plant caladiums in succession too, when I remember to. It's a great way to extend the season. And I noticed your little stromanthe in one of the photos. It looks marvelous! Usually they are singed on the edges this late in the summer. Thanks for sharing your oasis! i agree with saying you started your post off with. I love how you use different textures in you garden, this is something I need to work on. Hope you have a fabulous October. Thank you for stopping by and leaving your comment. It was so good to hear from you after a long time. Whenever I see your beautiful garden I think about about the pleasure and the peace that you must be getting. 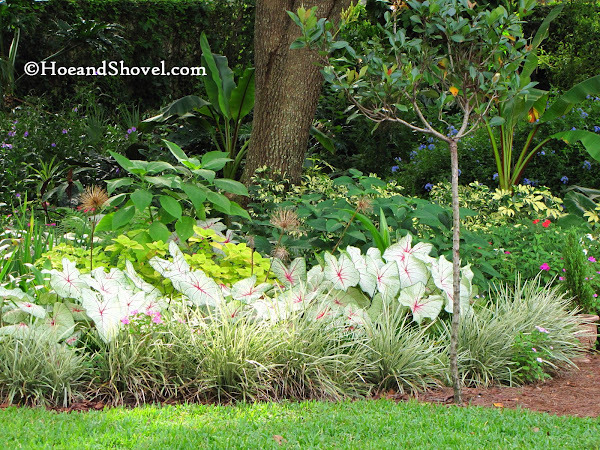 The combination of plants that you have planted side by side...the overall effect is lovely! Great shots of the spider web. It's always fascinating to see nature's detailed artwork. You're going to like the flax lily. This is the month when I'm very glad I went to the trouble of succession planting the caladiums. The stromanthe only receive filtered morning sun. I think that alone saves them a bit. They really do not like any direct sunlight. Fortunately boys love all things crawlie. I have a book on bugs that he snags to 'study' almost everytime he's here. Let me know if you are ever this far south! 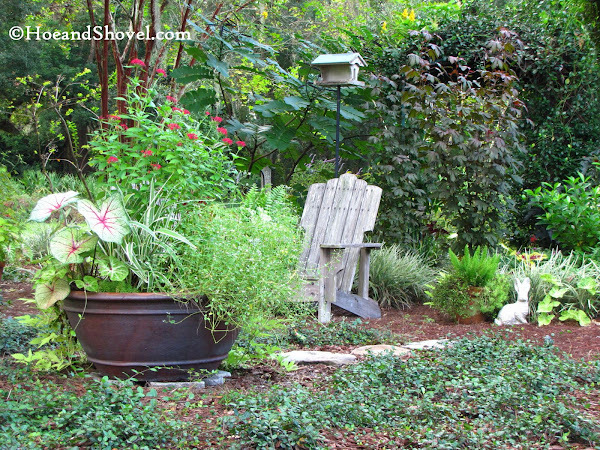 I think I'm finally getting to the season where we can just 'be' inthe garden and enjoy it. It really does offer a place of respite. I say that is true no matter the garden if we'll just take the time to enjoy it. Nice to visit with you again... thanks for stopping by.